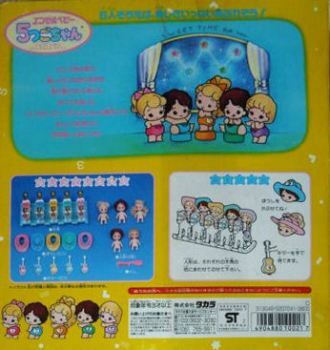 It seems that the version of Quints in Japan was slightly different. 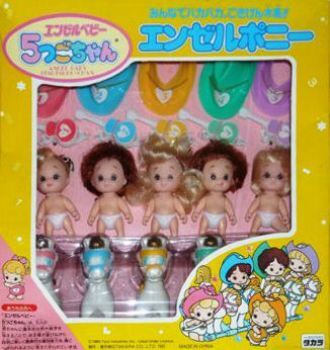 While they were still packaged as 3 girls and 2 boys, they were not identical.The box calls them Angel Baby Itsutsugo-Chan. In Japanese they are エンゼルベビー　５つごちゃん. 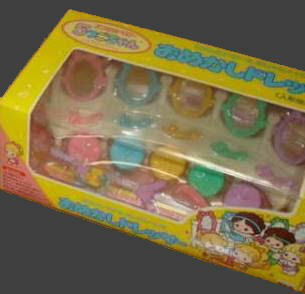 They were produced by Takara Toys (タカラ). 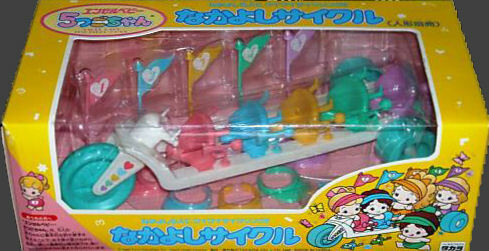 It seems that with some sets the dolls actually came packaged with a playset. These are the only sets I know of so far. I found the images on eBay. This site, its design, and all content within are Copyright ©2008-2010 by Zuse unless stated otherwise. All rights reserved. Quints name and logo are registered trademark of Tyco, Inc. The Quints Guide is intended as a reference for collectors and is in no way endorsed by or affiliated with Tyco. All names, logos, and trademarks are the property of their respective owners. Copyrights for the pictures hosted on this site are held by their respective owners.